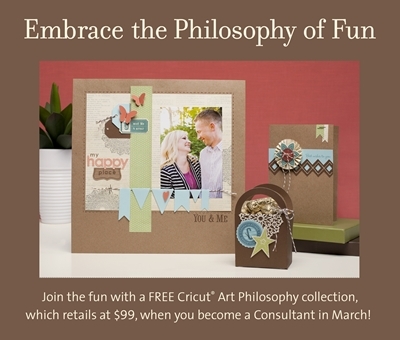 Celebrate Crafts: Free Cricut Art Philosophy bundle when you join my team! Free Cricut Art Philosophy bundle when you join my team! Isn't this so exciting?!? I'm jumping up and down and I can't wait for March 1st. I wish I could be a new consultant all over again so I could be getting $400 in Close To My Heart Products for just $99 but instead I'll just be so excited to welcome you to my team and help you get on your way!